LONDON (AP) — Philip Rivers threw for 306 yards with two touchdown passes and the Los Angeles Chargers held on for a 20-19 victory on Sunday in London after the Tennessee Titans failed twice on a go-ahead 2-point conversion with 31 seconds remaining. Marcus Mariota completed 24 of 32 passes for 237 yards and a touchdown for the Titans (3-4), throwing a 1-yard completion to tight end Luke Stocker on fourth down to pull within one after a review determined the quarterback was down as he ran for the end zone on the previous play. The Titans then twice tried to go for the 2-pointer and the win, with Mariota’s first attempt, a pass intended for Tajae Sharp, negated by a defensive holding call on the Chargers’ Casey Hayward and his second, to Taywan Taylor, tipped by safety Anthony Phillips. The Chargers (5-2) won their fourth consecutive game despite the absence of Melvin Gordon, their starting running back, because of a hamstring injury. Gordon, who entered the game third in the NFL in rushing with 466 yards and had scored a total of nine touchdowns this season. Austin Ekeler, in his second season, earned his first start in Gordon’s place and ran for 42 yards on 12 carries, but it was Rivers who shouldered the burden for the Chargers. He answered Ryan Succop‘s opening 28-yard field goal with a 75-yard touchdown pass to Tyrell Williams on Los Angeles’ first play from scrimmage — the longest touchdown scored in the NFL’s 11-year history of holding games in London. Michael Badgley made it 10-3 with a 29-yard field goal before Succop responded by making one from 33 yards in the second quarter. The Titans appeared poised to head into halftime with the lead before Mariota was intercepted by the Chargers’ Denzel Perryman at their 4-yard line when his pass was tipped at the line of scrimmage. Rivers, who completed 19 of 26 passes, then extended the advantage to 17-6 just over a minute into the second half when he found Michael Williams on a 55-yard touchdown pass. The Titans, who entered having lost their past two games, responded on the next possession when Derrick Henry had a 1-yard score to end a 10-quarter skid without a touchdown to climb back to 17-13. Succop missed a field-goal attempt from 51 yards — only his second miss of the season — and after stopping Los Angeles, the Titans took over at their 11-yard line with 4:55 remaining, driving the length of the field on the final drive. Running back Dion Lewis ran for 91 yards on 13 carries, including a 36-yard gain on the final drive that moved Tennessee into the Chargers’ territory. 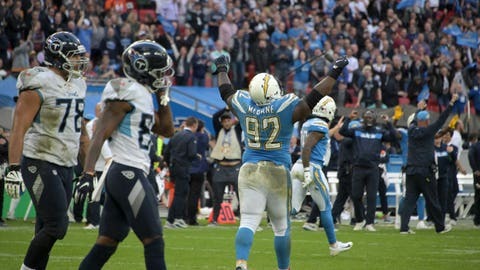 The Titans made their first appearance in England, while the Chargers played at Wembley for the first time since Oct. 26, 2008, when they lost 37-32 to the New Orleans Saints. Tennessee: Right guard Josh Kline was injured with 43 seconds remaining and replaced by Corey Levin and did not return. Los Angeles: Safety Adrian Philips injured an ankle late in the second quarter before returning in the third. Cornerback Casey Hayward Jr. briefly required attention after a hit on Mariota before halftime and WR Mike Williams also needed a moment after a hard fall in the fourth quarter but both returned.